Every so often a projector manufacturer takes a mighty swing and hits one way out of the ballpark. Such is the case with this fall's new Panasonic PT-AE3000. Panasonic's third generation 1080p home theater projector combines a breathtaking array of features with rich, satisfying image quality, and brings it all to market for an MSRP of $3,499. 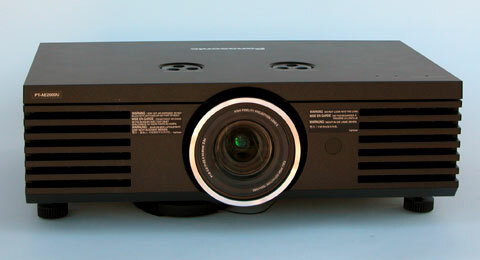 The AE3000 is one of those new benchmark-setting achievements that will cause the industry to rethink pricing on 1080p projectors. One wonders... how long can some brands continue to ask $10,000 and up for 1080p projectors when you can get stunning, high contrast 1080p picture quality and an unsurpassed boatload of features for street prices close to $3,000? Light Engine: 1920x1080, native 16:9, 0.74" LCD with a 165W UHM lamp. Connection Panel: Three HDMI 1.3 ports, one 15-pin VGA input, two sets of 3-RCA YPbPr component video, one composite video, one S-video, one 9-pin D-sub serial (RS-232c).